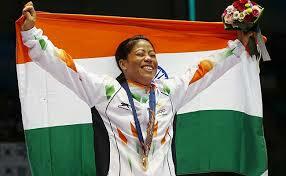 NEW DELHI — MANGTE CHUNGNEIJANG MARY KOM, the most celebrated female boxer in India, grew up fighting. She fought convention as the eldest child of a landless farmer in the fractious northeastern state of Manipur, where she drove steer across rice fields, work that boys in the village let her know, derisively, belonged to men. She fought lack of means when she trained in the state’s capital as a teenager — buying knockoff sneakers in a black market bordering Myanmar, making do with two meals a day, shadowboxing her reflection in a mirror. She fought her own body after undergoing one cesarean section for twin boys, then another for a third boy, then going back to train through postpartum sluggishness and her legs’ sudden unwillingness to bounce step. It is perhaps not surprising then, that Ms. Kom, 32, who goes by the name Mary, cannot seem to give up the fight. She is a five-time world champion, was the Olympic bronze medalist at the London Games, and gold medalist at this fall’s Asian Games in Incheon, South Korea. Her autobiography, “Unbreakable,” was released in 2013 at a ceremony hosted by the Indian actress and former Miss Universe, Sushmita Sen, who called it a story of “a woman’s road to emancipation and empowerment.” She was the subject of an operatic Bollywood biopicreleased in September that was a commercial success, perhaps the chief indicator of having arrived in India. But her rise has been punctuated by deep grievances, often against what she describes as a sports bureaucracy stacked against her and fellow boxers. At the Asian Games medal ceremony in October, another Manipuri boxer, Laishram Sarita Devi, tearfully refused her own bronze in the 60-kilogram category, protesting the judges’ decision to award the victory in a semifinal match to her Korean opponent. Ms. Devi was suspended by the International Boxing Association for unsportsmanlike conduct. Her colleagues, including Ms. Kom, stood by her, and India’s sports ministerwrote a letter to the amateur boxing federation pleading for the revocation of her suspension. For Ms. Kom, a devout Christian from the tiny Kom tribal community, who has remained somewhat of an outsider in India and who has railed against bias in judging, Ms. Devi’s suspension reflects deeper fissures in the sport. Some say Ms. Kom has used her grievances to her advantage, and they have certainly added color to her underdog story. But they have also isolated her, limiting her impact on India’s sporting culture. The Indian Boxing Federation suspended Ms. Kom for unsportsmanlike conduct in 2009, after a tied bout was awarded to her opponent, Pinky Jangra, from the north Indian state of Haryana. Ms. Kom used “foul language” with the judges. She lost to Ms. Jangra again in 2014, in a qualifier for the Commonwealth Games. INDIA has struggled to contain multiple insurgencies within its cluster of northeastern states, thinly tied to the mainland by a 14-mile stretch of land in West Bengal. Most of the states are dominated by tribal populations with ethnic ties to their Southeast Asian neighbors. When they come to Delhi or Bangalore for school or work, many complain of discrimination. Ms. Kom is no exception. On a Sunday several years ago, Ms. Kom was walking to church in a South Delhi neighborhood with friends, all Koms. A bus pulled up beside them, and the conductor called them Nepalis, implying, she said, that they were part of a migrant servant class. She does not remember who threw the first punch, but before she knew it, her male friends were fighting with passengers, while others fled. Many deflect criticism of judging bias in India based on state origins. But Ms. Kom represents a bit of a puzzle for the country — the pride and joy of Indian boxing, in the shape of a woman who bears little stamp of its dominant culture. Her complaints, he said, were an extension of the caginess she deploys inside the ring. But even as judges defend themselves against accusations of bias, some reveal deeply entrenched attitudes in India’s heartland about Manipuris. Ms. Kom, for her part, seeks a change in the boxing establishment through representation. She recently met with the sports minister and suggested three men who could be named as independent observers of matches, including one of her first coaches in Manipur. It has been a long road to holding court with ministers in the nation’s capital. When she first showed up at a national competition in the southern Indian city of Chennai, Mr. Kowli was a judge. He barely remembers Ms. Kom from that meet. But a couple years later, he noticed she had improved, how she moved swiftly around the ring in her left-handed stance, about 100 pounds of springy, buoyant energy. She circles opponents, deftly ducks punches, and lands left hooks straight on the face for maximum points. And she has a knack for intimidation. “When Mary Kom enters the ring, she’s already won,” said Mr. Sabanayakan. SHE has been described alternately as cagey and simple, humble and proud. Her focus now is on the Rio Olympics in 2016, where she hopes to win gold. She is seen as a straight-talker, and by extension, an ineffective diplomat. When she complains of bias, she does it with an air of setting the record straight. And she is not humble about her status — she wears the distinction with an air of vindication and defiance. “It happened because of God’s grace and my struggle, hard work, determination — because of my dedication,” she said. She wore a T-shirt with two gloves on it, each emblazoned with her name. Thoiba Singh, a former soccer player and husband of Ms. Devi, the boxer who refused her bronze, sounded weary when asked about prejudices in sport. But he also offered a possible explanation for Ms. Kom’s success. IMPHAL, Dec 27: Suspicious that the skulls and skeletons dug out during excavation of Tombisana HS campus might be of those people who disappeared in the hands of the security forces during the period when ‘enforced dis-appearance’ was endemic in the State, the Families of Invo-luntary Disappeared Asso- ciation, Manipur (FIDAM) has urged the Chief Minister to halt the excavation at the complex and institute a high level commission of enquiry. On the basis of initial expert opinion that the skulls and skeletons that were dug out might have been buried for 17 to 40 years, Md Baniyamin, general secretary of FIDAM said that this period roughly coincides with the time when the phenomenon of ‘enforced disappea- rance’ was endemic in Manipur. Speaking to reporters today at Kwakeithel, Md Baniyamin said that the body has submitted a memorandum to the CM demanding immediate halt to excavation at former Tombisana H/S campus and constitute a high level commission of enquiry to be headed by a retired judge. The probe panel should include experts in various related fields. FIDAM also demanded systematic excavation inside the premises to collect further evidences. Several people had involuntarily disappeared during the said period. Thokchom Loken Singh (1980), M Kaizalal Paite (1994), Kingsutlin Kom (1995), Ng Angpok (1995), NS John (1995), Laishram Bijoykumar (1996), Yum-lembam Sanamacha (1998), Khundrakpam Boyai (1998) and Md Tayab Ali (1999) are among those who disappeared during the said period, according to Md Baniyamin. The campus was occupied by the BSF, CRPF and Manipur Police for many decades, he said. Other demands of the body included systematic examination of the dug out skulls and skeletal remains and verifying the same with DNA profiling of families whose ‘loved ones’ had disappeared during the period. FIDAM also demanded that criminal proceeding be initiated in case any foul play is detected. A team of FIDAM who went to the site this morning was shocked to find that normal digging activity was going on at the site, Baniyamin said. The team was told by RC Chaterjee, an engineer of Simplex Project Ltd who super- vises the excavation, that normal excavation activity was being undertaken as no order to halt the digging was coming from the higher authority. The official also expressed his inability to halt the digging without orders from the higher authorities. IMPHAL, Dec 27: Referring to the discovery of eight human skulls along with a large num-ber of skeletons while digging earth at a place earlier occupied by Tombisana High School which has been shut down for quite sometime now, the Manipur People’s Party (MPP) has alleged that the skulls and skeletons were of people killed two/three years back when the Congress party was in power both in the State and at the Centre. Speaking to some media persons at their office today, MPP president N Sovakiran said that some of the skulls have still hair and parts of brain. At one point of time, CRPF and police commandos occupied Tombisana High School campus and civilians were barred from entering the school campus. Taking advantage of enforcement of Armed Forces (Special Powers) Act, security forces have been commi- tting all kinds of excesses at their whims and fancy for a protracted period. 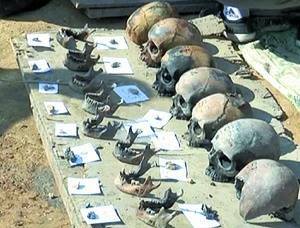 It must be checked whe-ther the number of missing persons as reported at different police stations matches with the number of skulls discovered, Sovakiran said. Questioning why those disgruntled youths who had taken the ‘wrong path’ in pursuit of certain demands were killed and buried, Sovakiran asserted that the State Government has been deliberately keeping NIA/CBI at bay despite all the fatal bomb blasts which rocked the State every now and then. He went on to allege that the incumbent Government led by O Ibobi is working at the behest of certain intelligence agency and all the bomb blasts which killed many precious lives were carried out by certain elements sponsored by the Government. MPP working committee member Y Priyokumar said that the discovery of eight skulls and a large number of skeletons would certainly spark off a serious human rights issue in Manipur. All necessary laboratory tests should be conducted without any delay so as to identify all the skulls as well as the skeletons. In case the State Government cannot identify the skulls and the skeletons within seven days, the National Human Rights Commi- ssion as well as the Union Home Ministry would be apprised about the disturbing discovery. MPP vice-president M Amutombi speculated that many unknown persons might have been killed and buried taking advantage of the layers of security rings put around Tombisana High School campus when it was occupied by CRPF and police commandos. New Delhi: Union Minister for Tourism, Culture and Civil Aviation, Mahesh Sharma, on Friday lamented that even though the Centre was trying its best to promote tourism in the North East region, restrictive permits like PAP, RAP and ILP were proving to be major hindrances. But obstacles like Restricted Area Permit (RAP) in some areas and Inner Line Permit (ILP) in some states in the North East have proved to be hurdles in promoting tourism in the beautiful region, Sharma said. While RAP has been lifted in some areas by the Union Government, ILP is still in existence in some Northeastern states, he noted. The Minister also pointed out that some states like Meghalaya and parts of Assam and Tripura, where ILP is not in vogue, are demanding for the same. This is happening despite the common knowledge that tourism is the only industry in the region that can provide employment avenues besides improving the economy of the region, he said. The Minister said that the Centre was granting visa on arrival to foreign tourist in as many countries as possible. “In many cases electronic visa is also available but within our own country we are facing these restrictive permits,” he said. Occasions of a visit of a Governor of a province to a district are always welcome, in as much as such occasions afford the people the opportunity to present their problems and desires to the distinguished visitor. This occasion of Your Excellency’s visit to Nagaland is specially welcome and the reasons are obvious. Your Excellency has undertaken this tour to these hills at a season when the treacherous hillside make a smooth drive along the hill road uncertain. In this, the Naga people have the assurance that your Excellency is anxious to meet their desires, and that their case will receive Your Excellency’s most sympathetic consideration. As is known to Your Excellency, the Naga people have submitted a Memorandum to His Majesty’s Government and the Government of India, asserting their right for self-determination and demanding the setting up an Interim Government of the Naga People for a period of ten years, so as to enable the Nagas to be so schooled as to make a responsible choice at the end of the ten years. Apart from the reply given by the Prime Minister of England to a question of Sir Walter Smiles, seen in the newspaper columns, no reply to this Memorandum of the Naga people has been received. The Naga National Council still looks for a reply, and reiterates the statement made in the Memorandum that: “A constitution drawn by people will be quite unsuitable and unacceptable to the Naga people. “it is our desire to make it plain to Your Excellency that it will not be enough to say in the end that a constitution has been drawn up on the lines suggested by the Cabinet Mission. We know that Your Excellency will concede that the Naga people has much right for self-determination as any other people. Our request to Your Excellency is to do all that is in your power to enable the Nagas to stand on their own feet, so that they may be worthy members of a civilized world. When a deputation of the Nagas very recently waited on Your Excellency, Your Excellency was appraised of the demand of the Naga people for the restoration of their old boundary. The ancient boundary with the Ahom kingdom, previously scrupulously observed by the Ahoms, has been overstepped throughout its length. All the valuable forests, previously a part of the Naga Hills have been transferred to Sibsagar district, or Nowgong district; an appendix to this is given. In fairness, justice and equality, Nagaland should be restored to the Nagas for it is our one great cry that Nagaland should be for the Nagas. We would urge Your Excellency to set up immediately a Boundary Commission to go into this very important question. In giving an outline of our Memorandum to the Sub-Committee of the Advisory Committee, we pointed out that Nagaland should be inalienable. We must state that any attempt to give any portion of the Naga Hills to non-Nagas in settlement during this transition period will be most strongly opposed. The Naga National Council stands for the solidarity of all the Naga Tribes. The present Naga Hills district has arbitrarily been carved out for administrative convenience only. It is now our desire that Your Excellency takes all steps to bring all the Naga Tribes together, for they will all naturally desire to be together. When the Naga people are seeking aid for their Interim Government, it is only fair and reasonable that they be not deprived of their just share, when the assets of the present Central Government of India are divided, and when reparation from Japan (the Naga Hills being the worst sufferer) is received. To this end we would urge Your Excellency to do all that is possible to help us. It is our earnest hope that this first visit of Your Excellency to our Nagland will not be the last, and that Your Excellency will next see us established according to our desires. One should appreciate and acknowledge what other people have done for you. A memory stone (monolith) may be erected in memory and honor of her or his contribution or helping the people. It is encouraging and laudable that Indian Army under Military Civil Action (MCA) projects have constructed some of the Soccer play ground in Senapati District, Manipur. Do you think the MCA is actively involved in bringing some infrastructures for the people in Senapati District as the present MLAs and Ministers from Senapati District and the Govt. of Manipur have no much developmental plan for the people? It is interesting to note that Purul Akutpa village play ground, which was constructed under MCA, is christened after the name Maj. Gen. KK Sinha memorial play ground as he helped to construct the village’s play ground. The Maram Khunou village play ground is named after Brigadier Sharma – the Taphou Phyamai village play ground is also named after Major General Binoy Poonnen. Why to name after one person when the contribution is or fund are from MCA, public or state Govt.? Naming of a place or anything after the name of the person who helps to do is nothing but shows only selfishness and hunger of fame. Why Tamenglong – Halflong road which was constructed by DC Amstrong Pame is not christened after him? This is very simple. He works for the public and not for his own fame. One may accept the concept of naming a village, place or playground if it is contributed individually and constructed the playground. But it is quite amusing when one uses his or her name using common or public fund. Do you think that in the future all the indigenous name of the place, village, house etc will be named after the name of the person who help to make or contributor? Is this trend of naming a road, play ground or anything after a person is a good sign? The ground was constructed under Military Civic Action (MCA) and not a single penny will be taken out from the concerned army officer. May be there will be someone who will bring some development in your village and he or she may want to re-name after his or her name. Will you sell your village for the sake of developments? It may be also possible that Senapati DC may bring some development in the District, and he or she may want to re-name after his or her name. Memory stone should be erected and placed it honorably. Credit should be given and we should acknowledge whoever contribute or do for us. But naming after the person who contributed or helped to bring development is little strange, selfish and fame hunger only. It is interesting that our Naga frontal organisation leaders are re-christening the meiteilon (Manipuri), British (English) and Indian (Hindi) name of the place into Naga indigenous’ name. For example: Tahamzam (Senapati) but simultaneously some people are naming the playground after their name. Why the UNC secretariat complex where the land was contributed by Kalinamai Taphou was not named as Kalinamai Taphou Secretariat Complex for UNC? Why the earlier play grounds which were constructed with the helped of the Indian army were not named after them? Is this naming a play ground after the name of the contributor’s is a new revolution of the modern educated societies who are hungry for fame or this a part of their mission to Indianised in the area? Why naming after an army officer when it was done under MCA? The Ministers and MLAs in Senapati areas have not contributed much for the development of the people. The same to the frontal Naga organisation leaders have not done much for the people in the district. So, we should acknowledge and grateful to the concerned army officers who have posted in the areas and brought some developments for the public. However, naming the play ground or any project that comes under their department is seems to be too selfish and too much after their own fame. With the present trends of naming anything after the person who contributed or helped to do something, in the future there will be no name left to be christened again except re-christening.